This is a guest blog by Philippe Marseille. 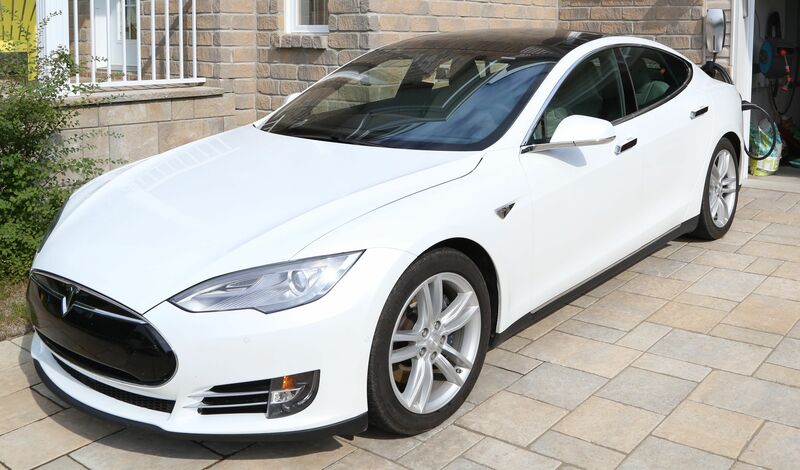 In it he explains his installation and setup of an eGauge system with Magnelab current sensors to monitor the power consumption of his Tesla S 85D (when charging), in addition to the overall consumption of his house. 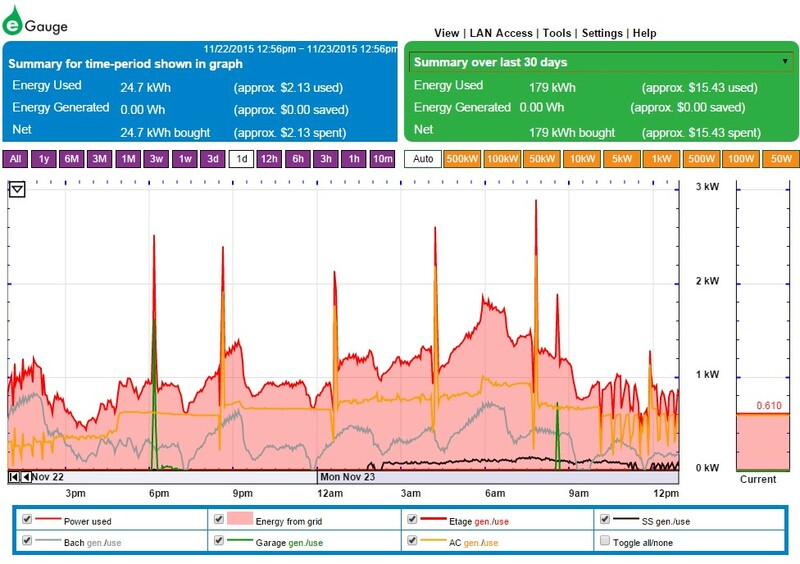 I like to track my energy usage (from my panels) for my Tesla charging power usage. 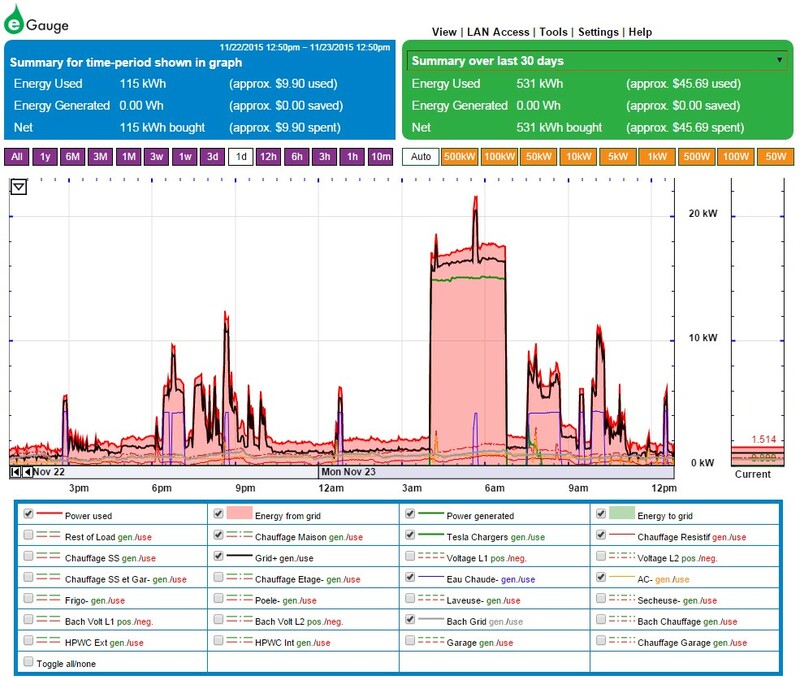 I recently switched my old setup which was using an Energy monitor (2 transmitters, 2 circuits monitored) to a full blown eGauge setup, which monitors most of my circuits at home. I wanted to share my experience here so that others could benefit from what I’ve learned. Disclaimer: I’m not affiliated in any way with eGauge; I did not get a rebate or anything. I simply bought the system over the internet and installed it. Each eGauge can monitor 12 channels, which, in most cases, will translate into 12 current transducers. In my case I used a few different split-core current transformers (also called CT’s): some SCT-0400’s by Magnelab and some SCT-075Rs by Magnelab (also sold as the ACT-0750 by Continental Control Systems). You need more than 12 channels? No problems, you can add another (or 10!) eGauge units to your setup. Then each one has its own database and web server and you can configure one of your device, the “main” one, to import the value from the secondaries. You supply it with power using a new circuit in your panel. Ideally, you should feed it with each phase of your grid connection. Here in US/Canada we mostly use Split Phase systems so it connects to the Neutral bus, the first phase and the 2nd phase. If you have a 3 phase feed, you use the L3 connection for the 3rd phase. EG3010: Ethernet and HomePlug AV: if you need to install it in your panel, that would be the one to choose. The HomePlug AV (aka Ethernet over power lines) is bonded on the L1 phase connector of the device, really neat: everything is in the panel and you use the Homeplug AV to extract the networking. 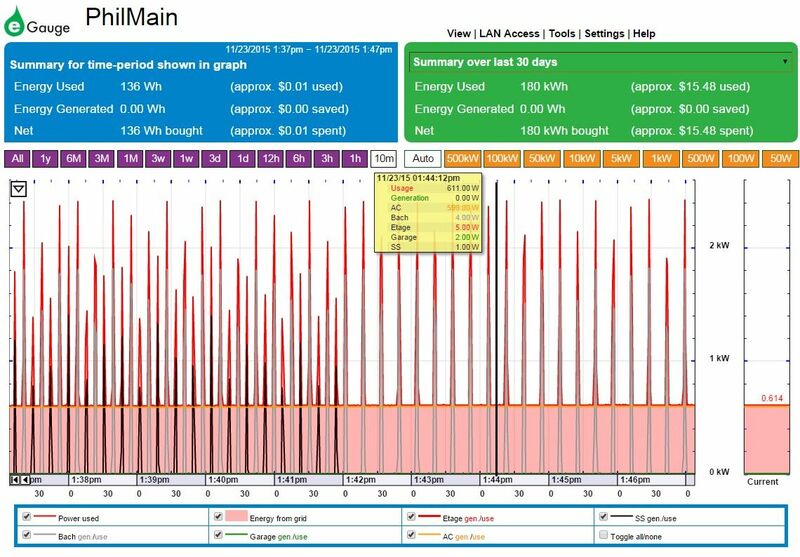 You can also use the HomePlug AV protocol to have multiple eGauges communicate with each other. 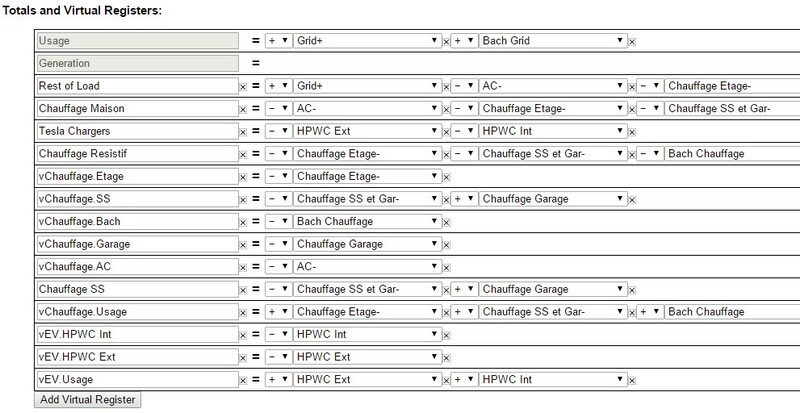 And 2 registers configurations: a register is a value that is stored over time. Let’s say you want to view/store the L1 voltage, you configure one of your register as “L1 Voltage”. On a 16 registers model, that means you now have 15 registers left. The more registers you have, the less detailed the history will be. After you’ve configured your device, here is what the homepage (web server running on the device) looks like (sorry, my register names are in French!). The green line at 4AM is my HPWC with my car set to 64A max. It’s pretty neat: you can change the colors of the lines depending of the flow of current, have some of the lines checked by default, etc. -The small green peak at 8:30AM is my garage: I got to work so I opened the garage door, backed the car out and closed the door. The heating kicked in for some time. Remote Devices: this is where I added my 2nd eGauge in my downstairs apartment (I have 2 feed from the grid). It supports a variety of devices, check their website! “P” means Power. Power is negative because it takes power from my panel (VS a generator or solar). It’s then CT4 * L1 + -CT * L2. Total and Virtual Registers. Those don’t count towards you register limit, they are calculated on the fly by the eGauge. 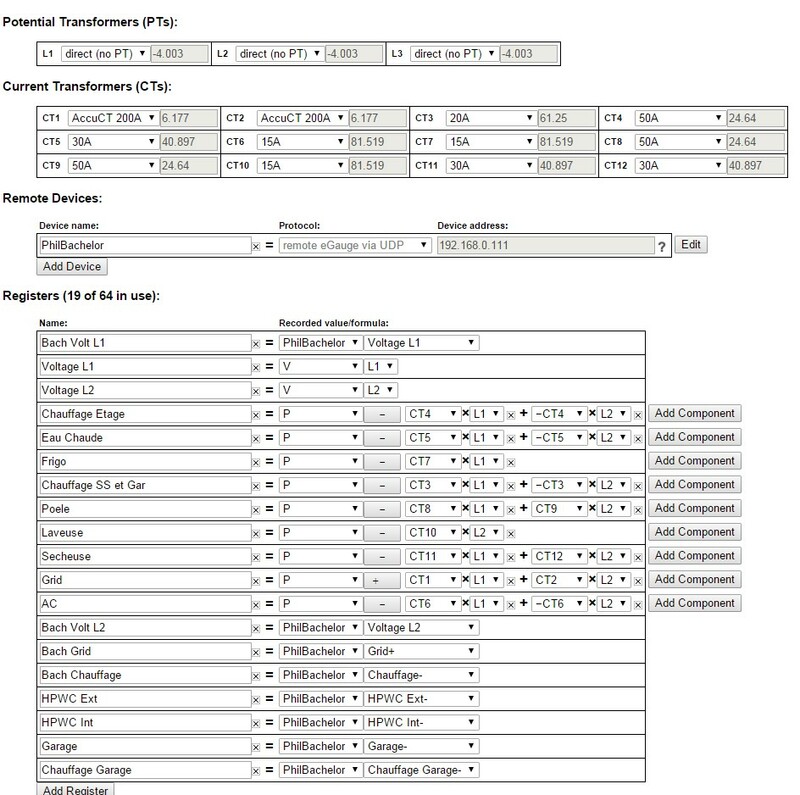 eGauge provides a “proxy” service. 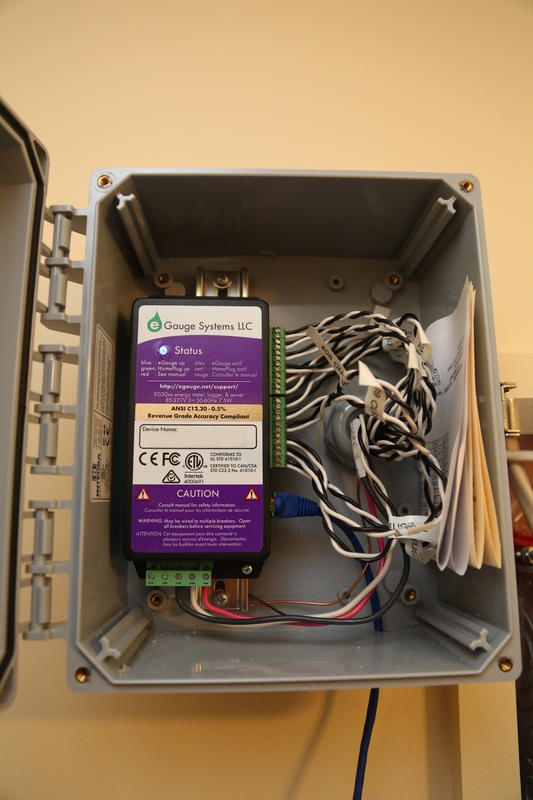 When the eGauge boots, it opens a TCP connection to their servers. You then get an address similar to “myegauge.egaug.es” where you can access your device. Remember: the web server is running on the device and the data is stored locally… It only creates a tunnel for the data to go through without having to open up your firewalls or having to redirect a port. When selecting a CT, you need to select the smallest possible (physical dimensions) one for you need. Most circuits will be OK with the 0.4in like the Magnelab SCT-0400 model they sell (should fit over one #2 AWG wire). Bigger gauge will required bigger CTs but I doubt anyone is the USA/Canada will require more than 0.75in like a Magnelab SCT-0750 (which goes up to 4/0 AWG). When selecting a CT, you also need to select the smallest possible AMP rating for your need. For example: let’s say your electric water heater is on a 30A breaker but will never exceed 20A, it’s preferable to use a 20A CT. The CTs are the most accurate between 10% and 130% of their load rating. This means that a 30A CT will be accurate from 3A up to 33A. By using the lowest possible rating you will maximize your bottom range of usage. If you need more precision, especially in the lower range of the load, they offer SCT-075R or SCT-075H Cts in 50A, 100A and 200A, all in 0.75″ size. They are rated at a maximum error of 0.5% (that’s a factor 0.002) from 1% up to 100% of their rating. But they cost more. Tip: if more than one circuit are on the same phase, you can put more than one wire in one CT and it works fine to add up those 2. I did it with baseboard heating circuits. If you’ve been following, you know that I’m monitoring 15 circuits and 5 of those are unbalanced so that means I needed 20CTs. 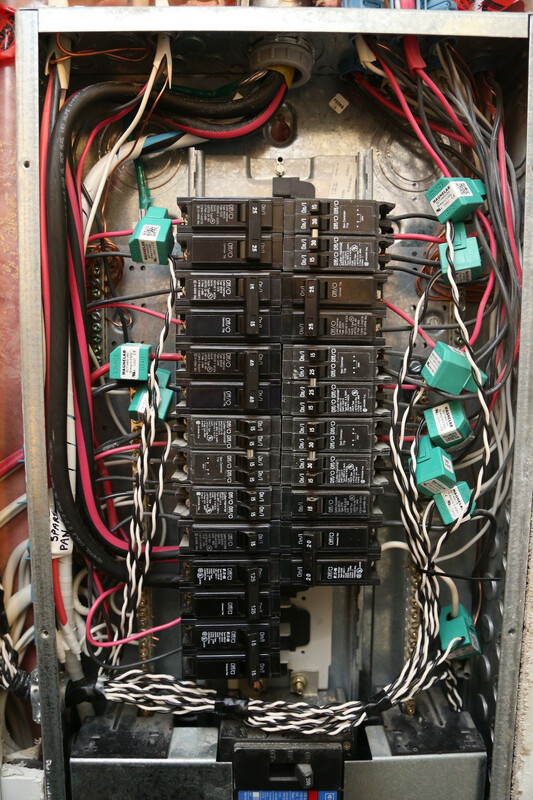 One circuit stills needs to be wired (an external 14-50 for when my wife buys her Tesla) so that’s 22 CTs (I know the That the UMC does not use the neutral wire but I want to be sure I get the load correctly so it means 2 CT for a 14-50 for the rare case family comes home and plug in their RV). I also decided to go with the AccuCT/SCT-075R for some of the loads so that I get “revenue grade accuracy”. -$584ea: EG3000 (A005-ETH-064): this is the Ethernet only model. Bought 2 of those. Base model is $494. (1% precision, no certificate). For $30 more you get the certificate and additional $60 gives you the 0.5% with certificate (which I chose, therefore $584 it is). Direct Link to model info. If you need the HomeplugAV model, add another $50 on top of that to get the hardware inside and you also need the HomePlugAV which is not included (they sell one for $35). The number of register is a software config, it does not change the price. -$35ea: 0.4in Split Core CTs. Available in a variety of current ratings (same price). There are several Current Sensor Manufacturers, I chose the SCT-0400 from Magnelab. I bought 14 of those for my heating, HVAC, clothe dryer, oven, etc. If you need the 0.75in model, they are slightly more expensive at $46. -$0.50/ft: split core CT Wire Extension (600V rated AWG twisted pair). I needed 50ft. -$36ea: extended warranty on the eGauge. Adds 3 years for a total of 5. 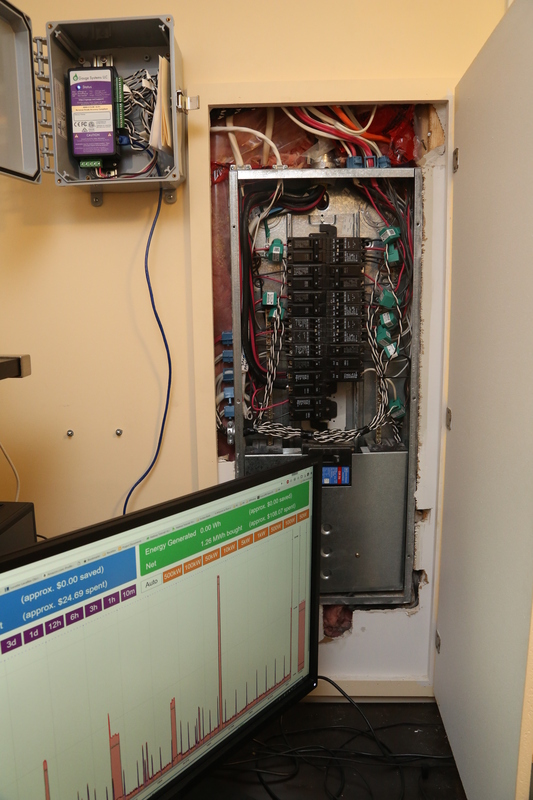 Total was a whopping $2467 but I consider this to be an extreme example (2 grid connections, 2 HPWC, 1 subpanel, lots of sub-circuits, etc etc). This does not include installation time / hardware (around $50-$100 in my case for the wire, conduits, breakers and conduit connectors). This setup costs $602 on www.aimdynamics.com again, over 15% less expensive. 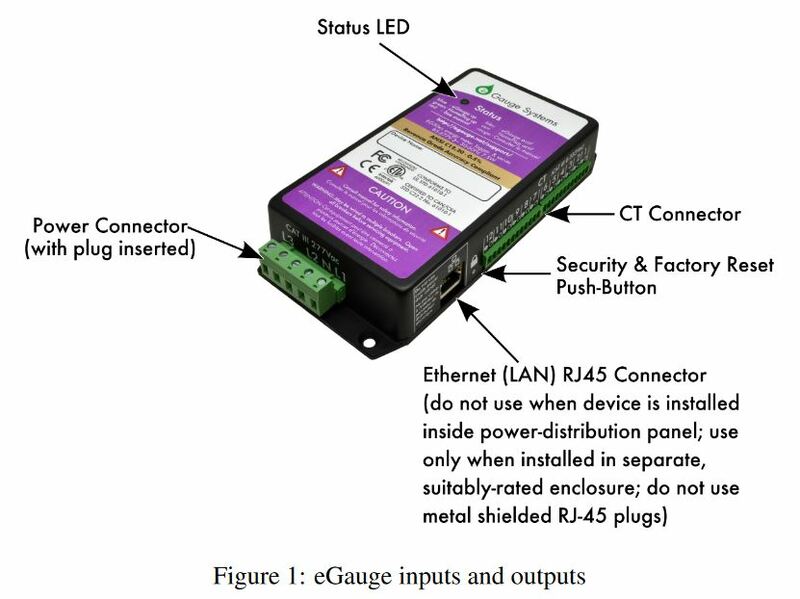 If you want/can install it in your panel, you can save on the enclosure but the eGauge costs $50 more and you need an Homeplug AV dongle for $35. Total is $85 so $11 less than an external install but you won’t need the conduit so it’s a faster install. For a detailed description of the custom API integration please check out the original post here.